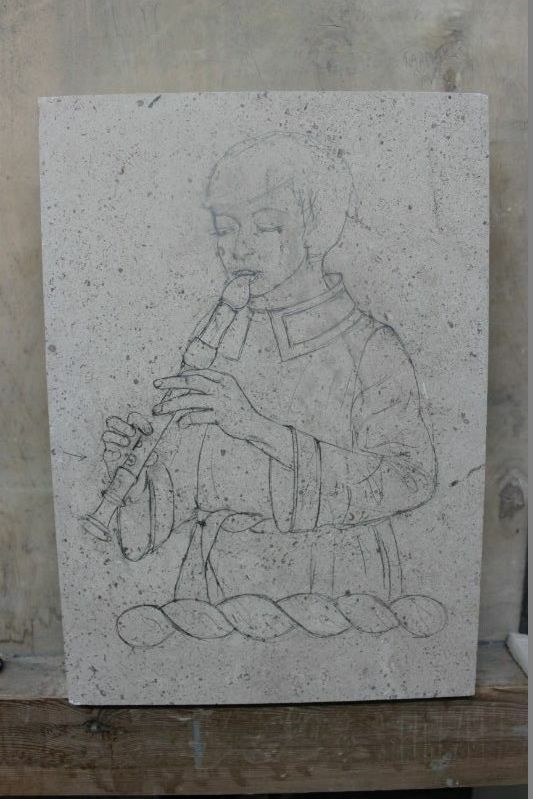 The steps involved in carving a heraldic crest in Hopton Wood limestone by Fergus Wessel of Stoneletters Studio. 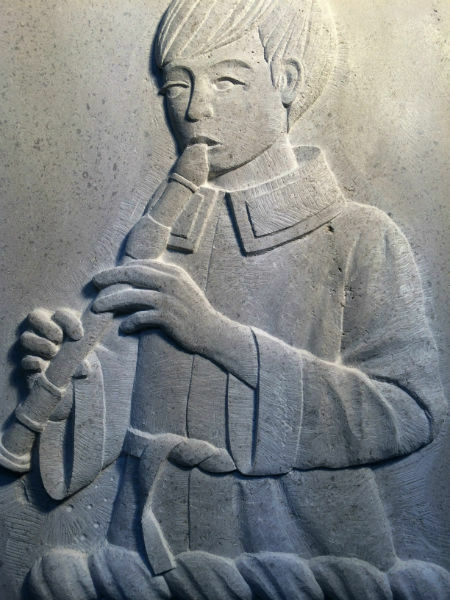 The process of carving a heraldic crest of a choirboy playing B flat on a recorder, into Hopton Wood limestone. 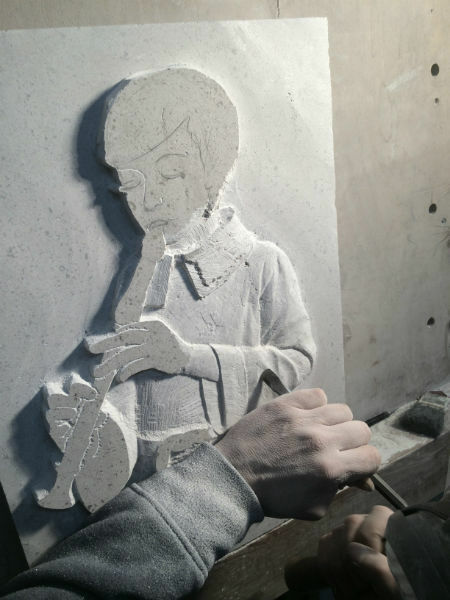 Using images from the Stoneletters Studio, this post goes through the entire sequence of stages in creating this heraldic crest, from the initial drawing on the stone, going on to the process of hand-carving and through to finishing the work. You can see the carver's hands at work in his studio. I choose a piece of stone that I feel will be free of too many imperfections. This is my last piece of fine Hopton Wood stone from Derbyshire much favoured by Henry Moore and Eric Gill. I know it carves beautifully and will not 'dictate' the carving. 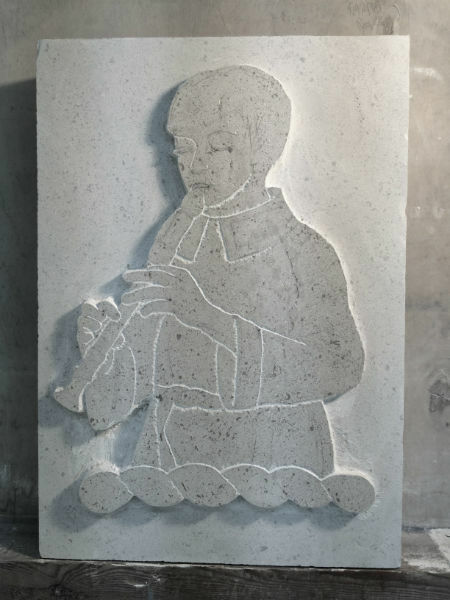 The image is drawn carefully on to the stone. My wife was my model; she had to learn how to play B flat on the recorder and we had to look up several videos of professional recorder players on U-Tube to make sure her fingers were in the correct position! It is important that the drawing is absolutely right from the start. Once drawn I normally photograph it so I have a reference for when I lose the pencil marks. As the sculpture begins to take shape, it will no longer be a drawing and will of course change in character; this is the exciting part! This is when the background is cut away to the correct depth, in the this case about 25mm. Here I use an angle grinder with a flush sided disc. It is then finished by hand. The final positioning of the sculpture needs to be taken into account. In this case the panel is to be fixed 3m up into a wall. Sometimes it's necessary to alter the perspective to allow for this, for example making the head slightly larger than life. I like to start off with a little detail; maybe getting into an area of drapery. This serves two purposes: firstly after all the planning and drawing I am eager to get cracking and cannot hold myself back like a child! At the same time it calms you and allows one to get over the initial impatience. You spend time with the chisels and design and it simply settles you down. Next I get the basic shape right and forget about detail for the moment. It is easy to lose one's way at this point. This is when the photograph comes in handy. If you like you can draw reference squares as a guide. Taking your time is important here; it's so important to step back and look again and again. Then I concentrate in an area of detail, usually the head and build up various elements until one no longer needs the photograph and the boy takes on his own character. 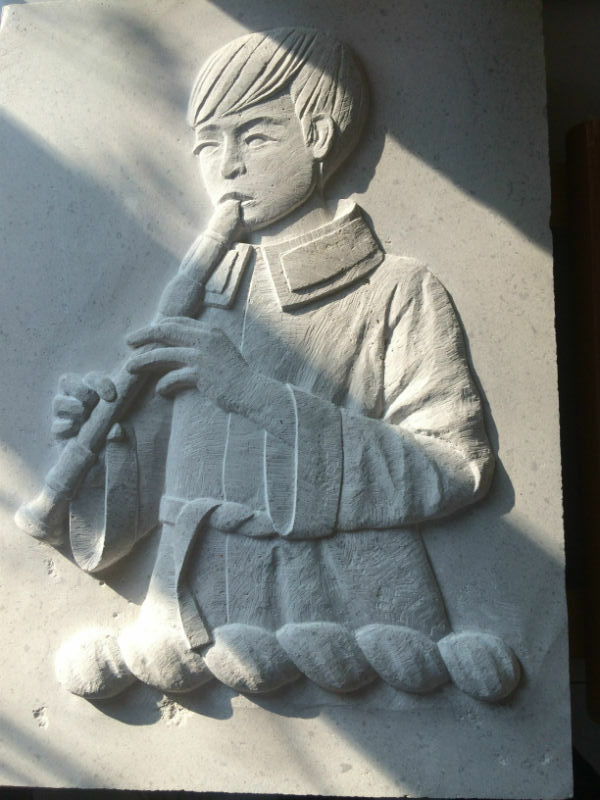 In this case the finishing was achieved with a chisel rather than rubbing it smooth with wet and dry paper. I wanted it to remain robust and lively.